The United States began using International Classification of Diseases 10th Revision (ICD-10) to classify and code causes of death reported on death certificates in January 1999. The 9th Revision (ICD-9) was used from 1979 to 1998 to report cause of death. The change to ICD-10 created a discontinuity in mortality trends that must be accounted for when comparing mortality data classified and... 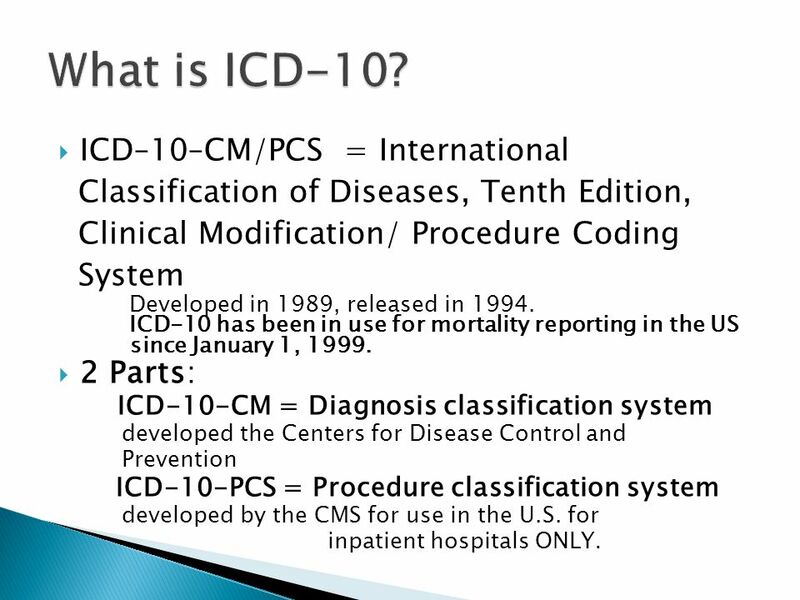 The purpose of this page is to provide background information on ICD-11, the WHO 11th Revision of the International Classification of Diseases (currently, the eHDSI MVC contains codes from ICD-10, the 10th Revision of the Classification). In 1977, volume 1 of the ninth revision of the International Classification of Diseases (ICD-9) was published by the World Health Organization (WHO). Volume 2, the Alphabetic Index, will appear shortly. By international agreement, this classification is to be used by member countries for mortality and morbidity statistics after December 1978.